The Titsa Abono Senior 65 is the latest reduced bus travel offer for all residents of the Canary Islands who are older than sixty five years. 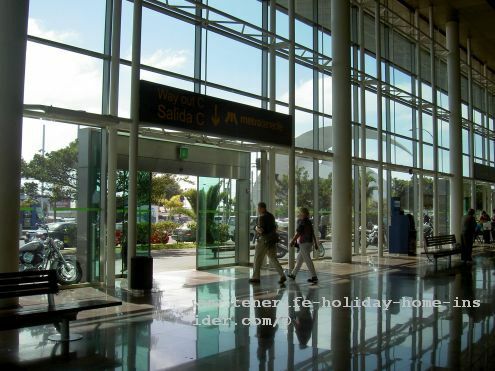 This comes in form of a new card that facilitates unlimited Titsa bus travel within one month on Tenerife, for example. The monthly price is Euro 30 and there is no obligation to buy every month. Mind that the Teide route or a Titsa bus trip to the Faro del Teno are not included. How apply to get the Titsa Abono Senior 65? Interested parties may make an appointment (a cita previa) by calling the telephone number 901 501 901 of the Oficinas de Atención Ciudadana del Cabilde. This translates into Citizen attendance by the Tenerife Cabildo government offices.This is how it is displayed as well on the poster beside. (Oficina de Atención Ciudadana without an appointment. 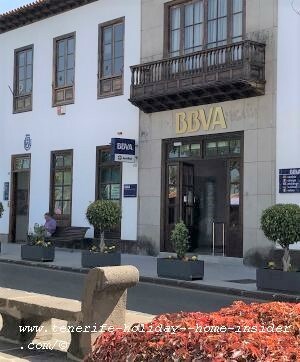 I've just been to the one which serves the Orotava Valley for Puerto de la Cruz, Los Realejos and of course la Orotava. You draw a number and wait for it to appear on a screen. The Cabildo employee fills in a form for you and he even takes a free photo of you. About ten days later, he shall call you to come to collect your Titsa Abono Senior 65 card. Mind that you still have to buy the Euro 30 credit which will be explained just now. Open in March 2019: 8.a.m. to 2p.m. Needless to say, proof of residence can also be the certificate (certificado) of Empadronamiento that may be attained at the relative Town Hall called Ayuntamiento of the town where the elderly or expats live. A NIE ID certificate may be required as well. 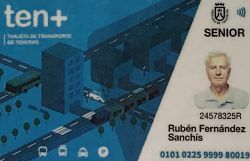 Later, the monthly bus travel card may be validated for another four weeks by paying again at any Titsa bus ticket counter, at MetroTenerife or at the so called Titsa Puntos de recarga (Titsa recharge points) some of which are Petrol service stations or small shops near bus stations. When will the new Titsa Discount for residents older than 65 become effective? It will officially start on February 01 of 2019. All these new fare reductions have been released for the Media on January 30,2019. This was done by the Tenerife Government Cabildo President Carlos Alonso, the Consejera de Acción Social, Coromoto Yanes and Miguel Becerra the director for the commuter mobility of the islands. 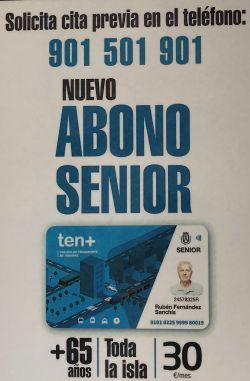 By the way, this monthly bus travel card for the elderly costs as much as the one called Tajeta Joven ( Card for the youth), while all children below 10 years of age can receive cards that entitle to free bus fares. Mind that there is another Titsa novelty card in a similar context. It's the card for large families (familias numerosas) Those may now travel with Titsa in unlimited ways for as little as Euro 15 per month from February 01, 2019 onward. Needless to say a Titsa travel card for a monthly set fee of Euro 30 is better for the elderly than the Titsa resident bus travel card for Euro 47.